"No. 1 in innovation" is an accolade ASU proclaims proudly in all realms of university life. Today, ASU proved once again that it is deserving of such a title. 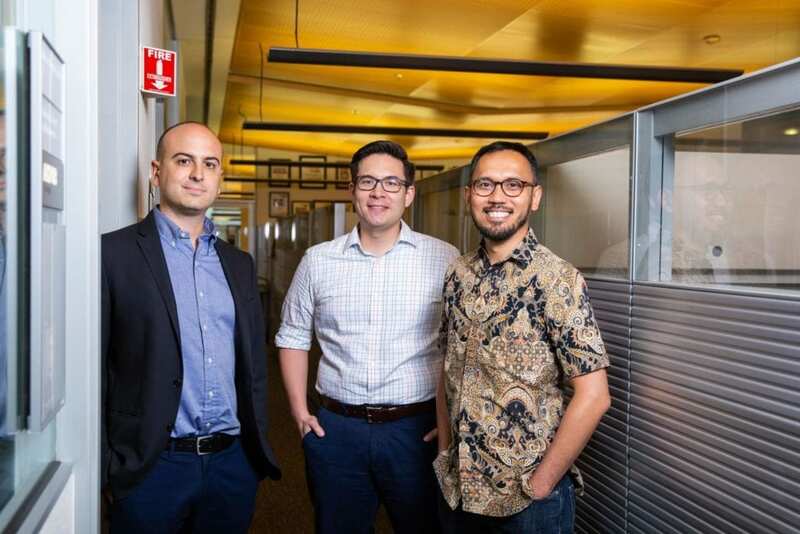 ASU professors, Nicholas Stephanopoulos, assistant professor in the School of Molecular Sciences, and Rizal Hariadi, assistant professor in the Department of Physics, both researchers in the Biodesign Center for Molecular Design and Biomimetics, were announced as the recipients of the 2018 NIH New Innovator Award. The award belongs to the NIH Common Fund's High-Risk, High Reward research program – a platform aimed at recognizing exceptional scientists with strategies that tackle biomedical conundrums. The New Innovator Award specifically "supports exceptionally creative early career investigators who propose innovative, high-impact projects," targeting investigators within 10 years of completing their doctoral degree or post-doctorate training. These are among the 58 awarded to investigators nationwide – each recipient receiving a $2.3 million grant for a five-year project. "This program supports exceptionally innovative researchers who have the potential to transform the biomedical field," NIH Director Francis S. Collins said. "I am confident this new cohort will revolutionize our approaches to biomedical research through their groundbreaking work." Hao Yan, the center's director since 2013 and a Milton D. Glick Distinguished Professor in Chemistry and Biochemistry, was integral in the hiring of each of these recipients. He believes that this award is "one of the most prestigious young faculty awards in this country." These aren't ASU's first New Innovator recipients. In 2017, Alex Green, also a researcher at the Center for Molecular Design and Biomimetics, received the award for his project aimed at expanding on RNA nanotechnology research. "We are really proud that three of the four recipients (at ASU) are in Biodesign and at this center. It's a huge honor," Yan added. According to Stephanopoulos, the award is NIH's way of demonstrating support for ideas that might be considered "totally new and kind of crazy." The NIH is saying, "We're going to take a gamble on you to pioneer in this new area." Stephanopoulos's lab focuses on peptide DNA nanotechnology, utilizing chemical techniques to build new hybrid nanomaterials while maintaining the programmability and structural control of the proteins. "Basically, when you make proteins now, you have to make them in cells, which can be difficult for some proteins, and then you're stuck with the natural amino acids. People have been trying to make proteins from synthetic peptides, and there is a reaction called native chemical ligation that links these peptides together. The problem is: that only works up to a certain length." "What I proposed was to make these peptides with two DNA handles on the ends. Each peptide ligation could be enhanced with DNA bringing those peptides together, carrying out the reaction, and then removing those DNA handles. You still have a DNA handle at the growing end of the protein, so you can link two peptides, chop off the DNA, and do this over and over again. In theory, you can get much longer proteins this way," Stephanopoulos said. "One of the big applications would be making completely synthetic proteins from synthetic amino acids. You can stabilize them, make better catalysts, integrate them into materials. Specifically, for this project, I proposed making membrane proteins called GPCRs, which are hard to make in cells and are very important in a number of biological areas. If you can make them synthetically, you can carry out modifications that enable structural biology on them," Stephanopoulos said. Stephanopoulos completed his undergraduate degree at Harvard University and attended UC Berkeley for his Ph.D. in chemistry. He originally intended to complete his M.D.-Ph.D., but later changed his tune when he realized that he preferred research. While in graduate school, he developed a keen interest in merging DNA nanotechnology with protein design, so he contacted Paul Rothemund, the inventor of DNA origami, who referred him to Yan. About five years after his first collaboration with Yan on a project, he was offered a position at the Biodesign Institute, and has since been there for three years. "This is one of the fun reasons to do science, to come up with these crazy ideas that push the envelope." Neal Woodbury, the director and professor for the School of Molecular Sciences, believes the relevance of Stephanopoulos's research makes him worthy of such an award. "The High-Risk, High-Reward NIH funding to Professor Stephanopoulos provides well-deserved recognition for his work on functional molecular design," Woodbury said. "He is a rising young star in the field, and this work focuses on designing and producing a class of cell receptor that controls many of the key processes in biology, opening the door for the design of more effective drugs." Rizal Hariadi's lab focuses on biomolecular interactions under different mechanical forces and uses techniques involving mathematics, protein engineering, single-molecule biophysics and DNA nanotechnology. "Malaria, as we know, claims half a million lives every year. It is equivalent to one malaria death every minute, and it affects half of the world population. The cost is $12 billion in terms of economic burden, so it's a big problem," Hariadi said. What's unique about Hariadi's approach is that he is using "DNA as a biophysical tool, not an information carrier." DNA origami will be used to arrange the proteins associated with this host invasion and apply tension. By studying the biomechanical forces and their effect on the system, molecules can eventually be screened for their ability to disrupt the malaria parasite invasion, thus translating into drug screening methods to treat malaria. "It is high risk because the jump from building DNA nanostructures to adding proteins to the structures is actually not a challenge that many labs would like to pursue," Hariadi added. Hariadi initially garnered an interest for science while participating on the Indonesian Physics Olympiad Team. After establishing his love for science, he went on to complete his undergraduate degree at Washington State University. His plan was to pursue genetics, but because he missed the math and level of rigor of physics, he decided to shift his focus to physics and biochemistry. At Caltech, where he completed his Ph.D., he worked with DNA nanotechnology. He went on to complete his postdoc at the University of Michigan and Harvard Medical School, where he studied actin and myosin interactions and super-resolution microscopy. "This is definitely the highlight of my career – I feel very honored I will get the support to pursue a big problem with a non-traditional approach. It is good to know that NIH acknowledged that ASU is a good, up-and-coming research university, which will help in attracting more talent to ASU," Hariadi added. Hariadi also noted that this recognition provides exposure to one of ASU's biggest goals as a university: inclusion. "ASU is truly an amazing place. At ASU right now, I am writing a paper with a father of five. I come across first-generation immigrants and students who are the first in their family to go to college. The fact that we are so open and inclusive – it doesn't mean we cannot do elite research. These awards show that NIH acknowledges our strength in research," Hariadi said. Yan believes that these awards are a testament to ASU's research vision, one that's characterized by an interdisciplinary focus. "ASU has become a very notable, highly-recognized research university, working on interdisciplinary research, solving problems that will be useful for society. Because we have this concept of interdisciplinary research, over the last 10 years we have been able to recruit talents like Rizal, Nick and Alex – we have provided the environment to nurture them," Yan said.